In the Pacific Northwest camellias may be planted either in full sun or part shade. Usually those planted in full sun will have more and larger blossoms, but the blooms on those planted in part shade will last longer. They may be planted in almost any season of the year, but larger ones will receive less shock if planted in the early spring or fall. Once established, the main requirements are fertilizing and watering. Because of the profuse bloom camellias provide, it is well to give an application of fertilizer right after the blooming period; it is at this time that the plant is making new growth and beginning to form the following year’s flowers. Most growers recommend two or three applications of commercial fertilizer a year – the first right after the blooming period, followed by two more light applications at approximately six-week intervals. 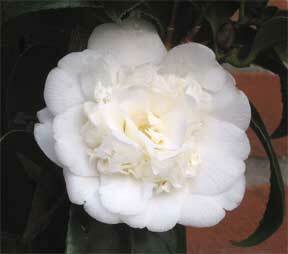 Camellias should be given a good watering at weekly intervals during the dry season. Sufficient water should be applied so it will soak into the ground to the lowest roots. Occasional spraying of the foliage with the hose is also beneficial both to the appearance and health of the plant and it will help ward off pests. Probably through fear of losing the following year’s bloom, many gardeners place too little importance on pruning. In addition to removing any dead branches close to the trunk and trimming outer ones to shape the plant, the inner branches should be thinned. This will produce more sturdy new growth and will have little effect on the bloom, as the inner branches seldom produce large flowers. They may be pruned at any time of the year, but if heavier pruning is done right after the blooming period before new growth starts, it will have little effect on the following season’s blossoms. Disbudding is recommended for growers wishing larger blooms for show or arrangement purposes. The practice is to remove all but one or two terminal buds and the majority of the lateral buds on each branch. However, this is not essential if the gardener is interested in profuse bloom rather than size. Few ornamental shrubs in this area require as little attention to prevent diseases and pests as do camellias. Scale, red spider and other pests, which require control in warmer, more humid areas, are almost unknown as far as outdoor camellias are concerned. Occasionally the bark at the base of small tender plants may be damaged by the so-called strawberry root weevil. With the possible exception of some light damage to foliage, these weevils seldom attack larger plants. Check with your local nursery or county agent on the best solutions and spray applications for control. In the Pacific Northwest some of the hardier varieties will bloom in late fall or early winter when few other flowers are in bloom, but the peak blooming season usually comes in March and April. Because various varieties have slightly different blooming periods, and as most plants are in flower over a period of three or four weeks, the principal season usually extends for three months. The beginner wishing to use camellias in his landscape has a group of literally thousands of varieties to choose from. Naturally, many of these varieties are not always obtainable from local nurseries, but are readily available in your area and are considered quite hardy.